Directions: Access via Paradise Trail- Turn south onto South Fork Rd from Hwy 199 just a mile east of Hiouchi. Travel on South Fork Rd for 7.3 miles. Trailhead for Paradise trail is on the west side of the road. Shuttle: Turn onto South Fork Rd from Hwy 199 and after crossing the second bridge turn right on Howland Hill Rd. 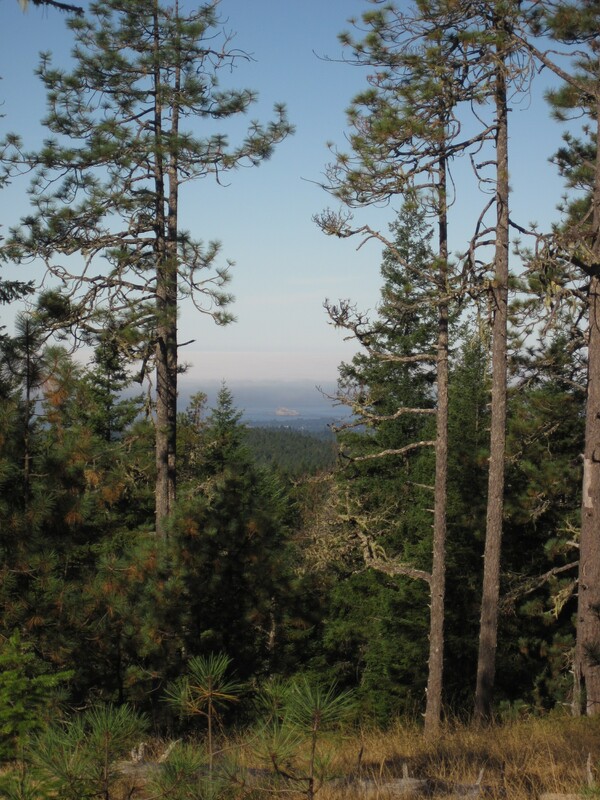 Travel 2 miles to a parking area on the left at the trailhead in Jedediah Smith State Park. The Little Bald Hills Trail is one of the premier mountain biking trails in the Smith River National Recreation Area as well as one of the areas more popular hiking and overnight destinations. 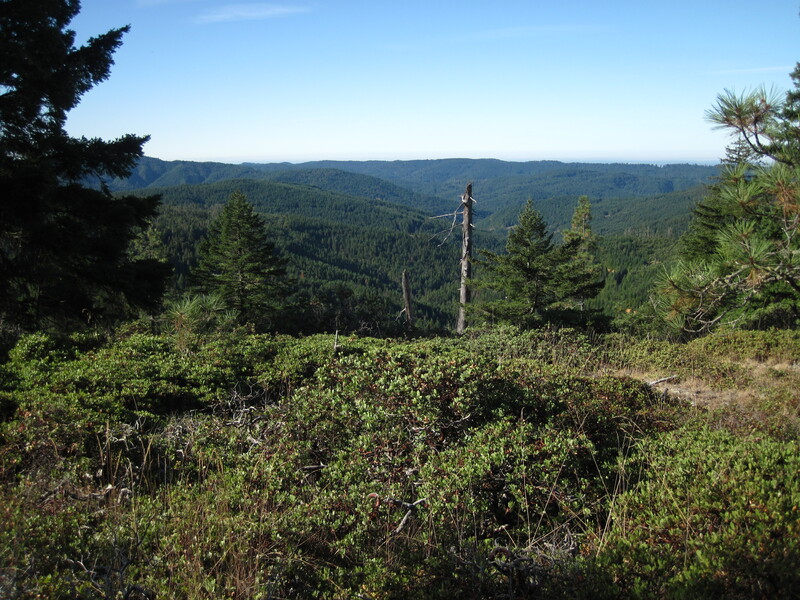 Start the one way route either via the Paradise Trail off of South Fork Road or from the trailhead in Jedediah Smith State Park on Howland Hill Road. If you are traveling on a mountain bike this trail makes a fun and challenging loop by beginning at Paradise Trail and connecting with Little Bald Hills Trail and then riding back to your starting point via Howland Hill Rd and South Fork Rd. The Paradise Trail connector is a steep start to reach the Little Bald Hills Trail, but there are plenty of distractions along the way to take your mind off the effort. In spring the trail is full of blooming iris and all year long Pileated woodpeckers pound away on a few dead trees about ½ mile up the trail. As the trail makes tight switchbacks and climbs the side of the mountain, a few gaps between the Douglas fir trees reveal views into the South Fork of the Smith River. At the top of Paradise Trail a sign announces your arrival at Little Bald Hills Trail. It points towards the park boundary (4 miles) and Howland Hill Rd (9 miles). An old trail to Rock Creek strays off to the left, but this is slated for closure soon to prevent the spread of the Port Orford Cedar disease. Turn right and follow the trail as it bends around the east side of the ridge. The wide portions of the trail are evidence that the trail was once an old logging road. The trail continues for about three miles at a mild incline until it levels off on the ridge top. Where the trail enters a grassy open area it’s possible to wander into the meadow on the south side of the trail for a glimpse of Crescent City on a clear day. If the winds are from the west sounds from town and the fog horn will drift up to the trail and Castle Rock Wildlife Refuge is visible offshore. Just past this point is the boundary between the Smith River National Recreation Area and Jedediah Smith State Park. Little Bald Hills Trail is one of the few State Park Trails in the area that allows bicycles. A mile beyond the boundary marker is the State Park backcountry campground. This campground is tucked down to the north side of the trail below towering Douglas fir trees. Five established campsites are equipped with tables, food storage containers, fire rings and a toilet. A non potable water spigot is installed, but you must either bring your own drinking water, or equipment to treat the spigot water. The campground does not require a permit or a fee. The end of the trail is just 3.3 miles from the campground, but those miles follow the trail down a continuous steep grade. For bicycle riders this downhill descent requires constant attention and good brakes. Be courteous to other visitors on the trail and to yield to equestrians. The trail descends through massive old growth redwoods and ends at the Howland Hill Road.